The repair of the shuttle during a space walk Wednesday marked a first in the history of NASA. Astronaut Steve Robinson smoothly removed material found protruding from between the tiles on the belly of Discovery. "It looks like this big patient is cured," Robinson said to flight controllers. Attached to a mechanical arm, astronaut Steve Robinson approached the underside of the space shuttle Discovery yesterday morning, to remove a protruding space filler. NASA deemed the repair, completed in about an hour, a success. Image is courtesy of NASA. The protrusions that concerned NASA officials were gap fillers  thin pieces of hardened fabric placed between the shuttle's heat-protecting tiles to restrict the flow of hot gas into the gaps. NASA wanted to make certain that the protruding fillers would not add extra heating to the tiles, as Discovery re-enters the atmosphere on Monday. To access the damage, a robotic arm on the International Space Station (ISS) maneuvered Robinson to the underside of the shuttle. Once positioned exactly in front of the tiles, his gloved hand was sufficient to remove the debris. NASA officials say they are relieved the operation went smoothly. "The crew demonstrated consummate professionalism and coolness beyond belief," said Deputy Space Shuttle Program Manager Wayne Hale in Wednesday's briefing. "They [the gap fillers] came out just as we thought they would. It looked easy but was not, which is a tribute to the crew and the team on the ground that planned it, so we're proud of that." The protrusions that NASA decided warranted repair were noticed in photos taken by ISS crew members as the shuttle performed a slow flip before docking with the station. 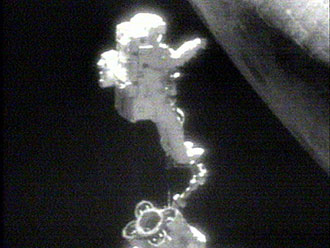 Thorough post-launch inspections via cameras and sensors are a new practice adopted following the Columbia disaster in February 2003.